If you look at the picture that come with press pack the untrained eye can spot a few tell tall signs that the band like to party. Beer in hand, an emptied glass on the floor, a discreet hip flask. All the band are smoking and I think one of them might be wearing a fur coat with not much else on. I am not sure if this is a pre-party shot are this is how the guys look after a 24 hour bender, cause I know Pirate Sons can play hard. I think they can party hard as well. They have built up a solid reputation since they formed in 2012 and although they have had a few changes in line up they are settled with the current team of Guitarist and Vocalist Ceallaigh Corbishley, who moved over from New Zealand in October 2011, Drummer Angus Ross joined in january 2012, and new addition Bass player Tom Diaz who joined Pirate Sons after living with the other guys for 6 months in a flat they shared.. This flat is the inspiration for their E.P and with songs like Dirty Dirty Rascals I can only shudder to think of the kind of crazy s**t they got up in their time. The E.P. 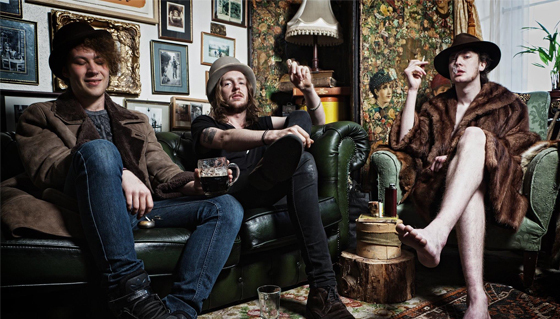 is jammed packed with rock n’ roll tracks inspired by the likes of the Blacks Keys, Iggy Pop and the White Strips and with the songs being recorded on 2″ tape and Chambers Studio, and the restriction of 24 tracks (compared to the unlimited tracks available in the digital age), has helped the band print a tight sounding record. 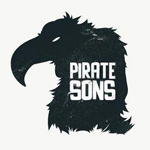 They are already making a name for themselves north of the border and moving in the same circles as the likes of Glasvegas and Wet Nuns, Pirate Sons are serious rock n’ roll players with an attitude to match.